Winter is just around the corner, which means it’s time you start thinking about winterizing your RV. Now, you can bring your RV to our experienced RV service team to get the job done well and quickly, or, you can learn how to winterize your RV yourself. On October 17, we will be hosting an RV winterization seminar. You will learn from our experienced team the ins and outs of properly winterizing your RV. From draining and disinfecting your tanks to flushing the pipes and filling with the proper antifreeze, you’ll be happy you took this FREE seminar. Registration is easy and space is filling up fast! Join us October 17, where you’ll also meet other RVers in the area. Other upcoming seminars include a November 7 seminar on RV electrical systems. This seminar will teach you everything you need to know about caring for your RV’s electrical system. You will learn how to tell the difference between amps, volts and watts. You’ll also discover how to protect your RV from power surges and how to power up your RV using different sources. 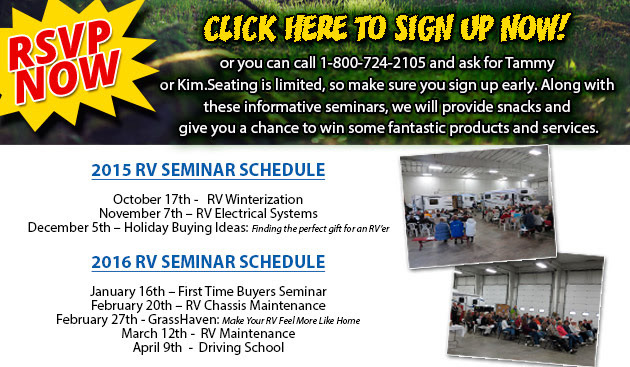 At Wilkins RV we are proud to offer a wide variety of RV seminars that are completely free. Our goal is to educate and equip our customers so they can make the most out of their RV. We also invite you to check back frequently as we update our seminars frequently, and, if there’s a topic you’d like to learn more about be sure to tell us. Register here for any of our upcoming seminars or contact us. We can answer any other questions you have.